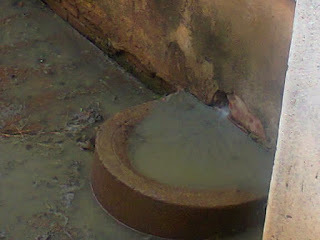 Mandava, one of Zvishavane's oldest suburbs is sitting on a health time bomb as raw effluent has become a common feature in almost every corner, at some points forming smelly pools across the rugged streets of the high-density suburb. The disgusting sewage rivulets seem to disappear for a day or two when council makes some token interventions only to re-surface for a lengthy period, much to the annoyance of residents. People who spoke to this publication said they were not convinced council was doing enough to rectify the problem; saying instead of directing resources to overhauling the ageing sewer infrastructure, attention was being given to less important issues. "We now fear for our children who are constantly exposed to infection by contaminated sewerage water which has now become a common sight," said one resident of Mandava. The sewage at times flows right in front of backyard food outlets behind the 'Mudhadhadha' shops, a situation that worries the residents. "May the responsible authorities quickly take measures because it is not good to always frog jump pools of sewage close to food outlets," said Cliff Mutenda who stays in the same suburb. The poorly maintained roads in the town have not helped matters, with sewage forming small pools in the potholes.